Adrian Cheng may only be 36 years old, but he’s undeniably taken the Chinese business world by storm. For starters, Cheng is the Executive Vice-Chairman and Joint General Manager of the New World Group, a Hong Kong-based business empire that was founded by Cheng’s grandfather in 1970. The company—one of Hong Kong’s largest—focuses on property development, infrastructure and services, retail, and hotels, and Cheng supervises its daily operations. Equally impressive is Cheng’s position as Executive Director and Creative Director at Chow Tai Fook, a luxury jewelry company, where his responsibilities range from branding and marketing to strategy and e-commerce. While Cheng has some serious business chops, the successful scion is making waves in the art world. He is involved with over a dozen arts-related organizations, including the TATE International Council, the Public Art Fund of New York, and the National Museum of China Foundation. Of course, Cheng’s accomplishments don’t end there—in 2008, he founded K11, a high-end lifestyle brand that marries art and commerce, declaring “In Art We Live” to be its mantra. 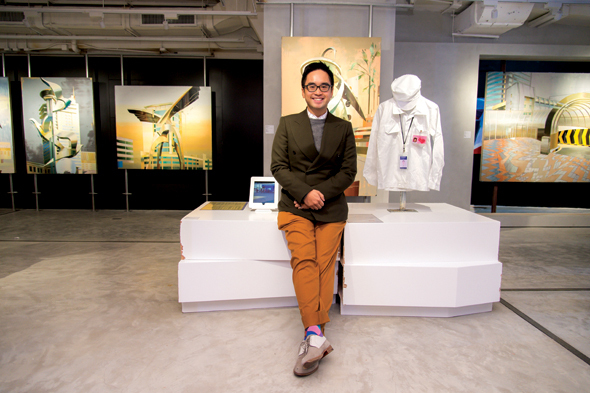 K11’s two Art Malls—located in Hong Kong and Shanghai—feature unique museum retail settings and sustainable efforts, with art-infused public spaces, urban farming, and classes about farm-to-table practices. There’s also the K11 Art Village in Wuhan, which offers studios for artist-in-residence programs. The pièce de résistance, however, is the K11 Art Foundation, a non-profit that ties all of K11’s many moving parts together. The organization has brought Claude Monet and Salvador Dali exhibitions to the K11 Art Mall in Shanghai and has partnered with institutions like Palais de Tokyo and Centre Georges Pompidou to give Chinese artists worldwide exposure. Cheng identifies himself as an art entrepreneur and pioneer, and rightfully so. With art, people, and nature as K11’s core values, his vision is changing the landscape of contemporary Chinese culture. In town to speak at the FT Business of Luxury Summit, Cheng met with SOMA in the lounge of the W San Francisco to discuss the K11 brand, art in China today, and how he feels about East-Meets-West aesthetics. K11 is a brand that is disseminating art culture to the Chinese masses and infiltrating their daily lives. We want to incubate Chinese artists and curators and to groom an audience. Chinese millennial VIPs are searching for a certain cultural identity, a spiritual search for themselves. If they don’t have a cultural identity, it means they cannot represent themselves outside of China. If you’re American, you have Hollywood, pop music, a lot of achievements that represent American culture. Young Chinese people are always searching for that. And when K11 came to Shanghai, it became the culture. Because it’s from China—it’s an identity that they feel is theirs. We have originality from our own history but we cannot negate the fact that there is a Western influence. A lot of people think China is only a copy-cat, but because China is so big and it’s chaotic, it becomes a creative hub. How do K11’s Art Malls function for people who don’t appreciate art? There isn’t a strong public art education system in China. People don’t have the habit of going to galleries and museums. They don’t know how to appreciate art. It’s not their fault. We love to convert people who are not even interested in art into being interested. It’s supposed to be part of the education system. It’s not supposed to be my job. It’s supposed to be the museums’ job. But now it’s my job too, to some extent. I have multiple roles. How has art changed since you started the K11 brand? In the last five years, we’ve seen a lot of millennial artists emerging. The millennial artist has a different perspective. Auction market artists focus a lot on political art, cynicism, realism, and irony. The new generation of millennial artists don’t think about politics anymore. They create their own ideologies, idiosyncrasies, and ideals—their own way of looking at life. Now you don’t see them as only Chinese artists; you see them as good or bad artists, that’s all. Why did you construct K11 with a museum concept as opposed to a gallery setting? I don’t want to sell art for the artists. We want to build a platform for artists to exhibit and for people to learn, discover, get educated, and be inspired. It’s much more pure and neutral. How do you see K11 expanding in the future? We’re opening sixteen malls in China in the next five years. I want to focus on greater China first because there’s a lot of potential, but eventually I would like it to be global. Right now I’m launching my new designer market e-commerce site. We’re also incubating fashion designers, fashion brands. You’ve designed jewelry for Chow Tai Fook in the past. Can you tell me about your design work there? We always want to create things that are original. It’s not West, it’s not East. It’s a new genre. I don’t like the East-Meets-West fusion. It’s tacky and passé. Creating originality is original. Everyone likes it. There is some inspiration, but it’s collected everywhere. Most of the artists you see in SFMOMA, for example, created their own style that no one had seen before. This is the same. Are there any specific artists today that you feel represent Chinese culture or are redefining it? Zhang Gn Li. His art is a hybrid of abstract and figurative art. He plays with memory, romanticism, and spontaneity, and uses brush strokes that are like calligraphy. It all comes down to a new way of creating art.